Nema Globe Pot Popper Nematodes Kills Gnats in Potted Plants. One Pot Popper contains product to treat 8, 5 gallon plant pots. Simply add to the soil and water in. 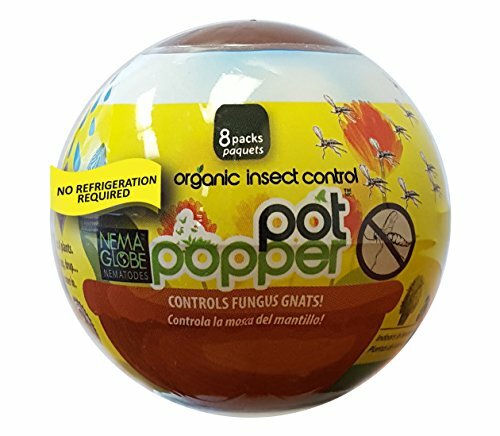 Nema Globe Pot Popper Nematodes should be used with every bag of indoor potting soil used to help prevent gnat infestation. Now in ARRIVE ALIVE TECHNOLOGY non-refrigerated format. Manufacturer: The Environmental Factor Inc. Publisher: The Environmental Factor Inc. Studio: The Environmental Factor Inc. If you have any questions about this product by Nemaglobe, contact us by completing and submitting the form below. If you are looking for a specif part number, please include it with your message.